They say love heals all wounds, but what if the path to that love was the very cause of those wounds? So it is with Jerin Endersul. Despite the love he found in Juli, their union has left him isolated and impoverished, and every time a potential solution appears on the horizon, life throws another obstacle in the way. Living with Julianos Tenzalin meant getting a job closer to their new home, and all that was left in the desolate town of Sendura was the module plant, where an accident necessitated Jerin to undergo drastic surgery that left his dreams in tatters. Just as he allowed himself to believe he may be improving, the crippling headaches that once blighted Jerin’s existence make a very unwelcome return. His consultant offers him a solution in the form of a new wonder-drug, PSI-626, that has the most bizarre side-effects, allowing him a glimpse into the secret life of the partner he now rarely sees. Adrian (Ade) Hawkins lives in Norwich, England, with his loving, ever-patient wife and two beastilicious moggies. He discovered a talent for storytelling in high school, despite not getting an English GCSE. He realised he had a yearning to write while drawing cartoon robots in art class, spending most of his time pondering the story behind them. punctuated by surprisingly good bits. He then spent 12 years being overwhelmed by his own ambition and spent far too long faffing about with conceptual ideas before finally coming up with an idea for a novella that then evolved into his debut novel. His favourite authors include Douglas Adams, JRR Tolkien, GRR Martin, Terry Pratchett, Ian Fleming and Rob Grant and Doug Naylor. He should also watch less movies and read more books. What makes you feel inspired to write? The world, its people, their interconnecting stories. Love, hatred, and all the shades in between. The frustration of politics, how we are dominated by a privileged few who commit truly heinous acts that would sicken all. I believe it was George Bush Sr. who said that if people knew what they’d really done the politicians would be chased down the streets and lynched. I fear this is very true… only a veil of lies maintains peace in America, and likely here in the UK too. It’s frightening to contemplate. I like to have a plan in place, then kind of wing it. Falling started with more of a concept than a story, and it took me a while to work out what the real story was. Even when I finally nailed that aspect, nailing all the little details down was tough. It had to be about the characters, who had to be compelling, as they are the driving force of the tale. My next book (Firebrand) started with as complete a map as I could create at the time, but it’s changed so much that, at times, I’ve had to stop writing for a little while, take stock, and refresh the outline so I don’t start meandering. It’s a big book, and while I want to smell the roses along the way, I don’t want to linger. It has to keep moving forwards. I’d love to do more at home, but my paid work hours are insane — I work nights, half a day removed from all the sensible people, so I take a cheap laptop to work with me and get most of my writing done on breaks. That job is particularly lonely and mindless, so I get plenty of time to contemplate plot points I might be stuck on. Most of the writing process takes place away from the computer. What is the highest goal that you desire to meet as an author? To write the best books that I can write. I’ll never be able to make them perfect, but since I can’t guarantee the financial success of anything I write, I always strive to write something I can look back on and be proud of. If it could have been anyone, it would have been Douglas Adams. Sadly, that dream won’t come to pass. He had such a unique style and perspective, and Hitchhiker’s Guide will always remain one of my favourite novel series. Practice. Write. Short, long, whatever, just write. Be judgmental of your own work. Get feedback from lots of people. Listen to negative feedback more than positive, but look at it objectively — try not to take it to heart. That can be much harder to do in practice than it sounds — most authors pour their heart and soul into their work, and there are some potentially great indie writers out there who just need a push in the right direction. That said, there are a few would-be authors who might find it best to redirect their energies towards something that suits them better. Too many times I’ve heard people tell me, upon learning that I write, that they’ve thought about writing a book, when the simple truth is that not everyone can. It takes a lot more time and discipline than most people think. A book can take hundreds, if not thousands, of hours to complete. What is in your To Read Pile that you are dying to start or upcoming release you can’t wait for? I’ve read the first novel in GRR Martin’s A Song Of Ice And Fire series, and would love to read more, but they’re so massive I just don’t have the time for the rest at the moment. I’m currently reading Neuromancer, and while some of its jumps can be a bit hard to follow it’s an incredible book that clearly paved the way for much that followed. Without Neuromancer, there would be no Matrix, and Neuromancer is a much better told tale. The scope of it is astonishing. To visit Japan with my wife. I don’t have a physical bucket list, but I suppose I should get around to writing one really. Me and my wife got married in Las Vegas last year; I used to be an official Pokémon Master, back when Nintendo UK did events at Burger King, which was dorky but fun; I have met every single member of the main Red Dwarf cast, and remaining active creator, Doug Naylor. Firebrand is the next installment in the Spirits & Shards saga, and is the first “full” volume in the series. It’s much longer, currently sitting at well over 700 pages, and concerns Kol Solborn, Keresay Kosoruka, and Haikyo Tinjima primarily, though the ancillary cast is huge. I don’t want to say too much about the story for fear of ruining any surprises, but it’s epic, and somewhat inspired by the shadowy machinations of corporate politics. 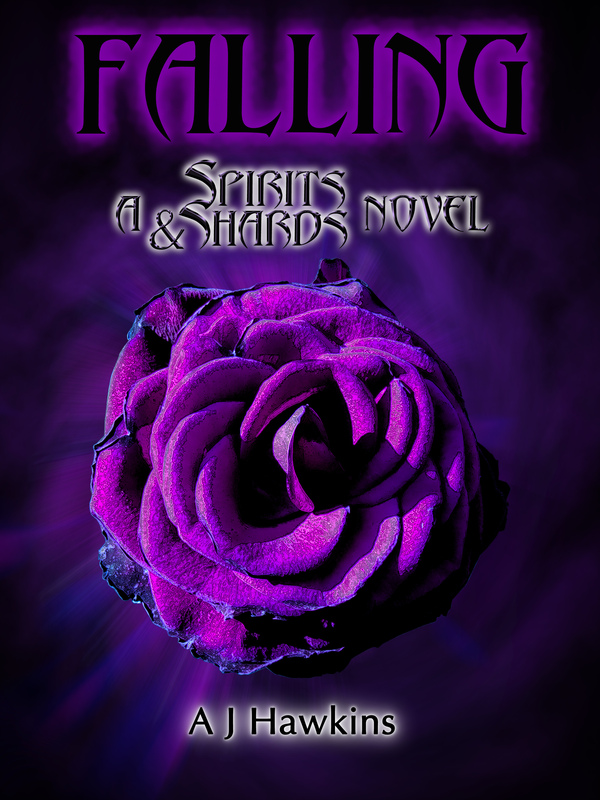 I have a series of blogs on my official writing site where I talk about the ideas and inspirations behind some of Falling’s bigger moments. This format allows me to go into far greater detail than I can here, so I would be very grateful if any interested parties would take the time to head over to www.zenpub.org — and please feel free to leave comments. If there’s anything you want to know that I haven’t touched on, please tell me, and I would be very keen to share that information with you all, be it plot points, characters, or scenario.